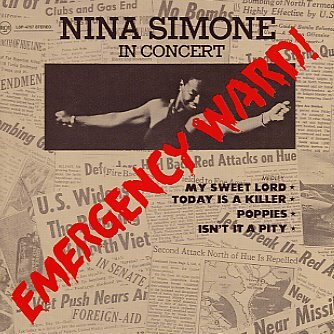 A great little album cut by Nina Simone during the time she was working with Weldon Irvine – a live album that really has the lady stretching out, and showing off all the cool, complicated grooves she brought to a concert setting! Weldon did the arrangements, and they've got a very righteous feel overall – which really seems to inspire Simone in her interpretations of the tunes, as she improvises a lot and really takes off with the lyrics! The album includes a really haunting version of "My Sweet Lord", the classic "Poppies", and a great poem/song called "Today Is A Killer" that goes on for over 15 minutes! © 1996-2019, Dusty Groove, Inc.